DA Form 2166-9-3, NCO Evaluation Report, CSM/SGM is a U.S. Army form used during the evaluation of Non-commissioned officers (NCOs) ranked Command Sergeant Major (CSM) or Sergeant Major (SGM). This form is part of the DA 2166-9 series that consists of six NCA Evaluation reports in total. The latest version of the form - sometimes mistakenly referred to as the DD Form 2166-9-3 - was issued in November 2015 by the Department of the Army (DA). 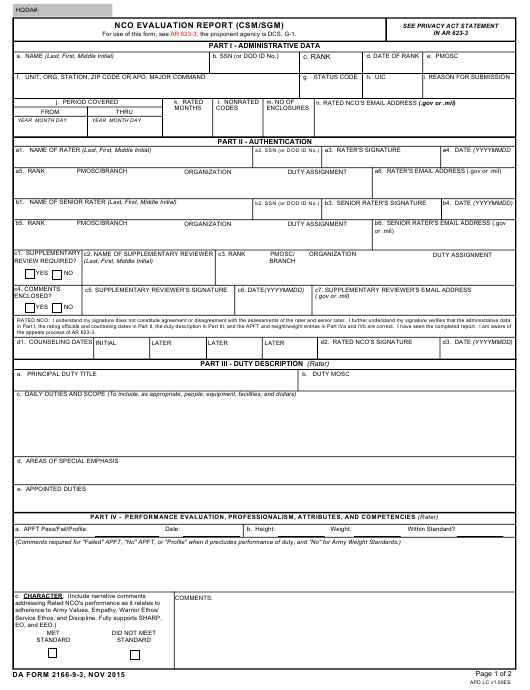 An up-to-date fillable DA Form 2166-9-3 is available for download below or can be found on the Army Publications Directorate website. The DD 2166-9-3 is a strategic report. Authorized raters and senior raters are required to provide their assessment of the CSM/SGM NCO's yearly efforts. Both the NCO and their rater are required to fill out specific sections of the five-part form. The five parts include a section with administrative data, an authentication of all participating parties, a duty description, an evaluation of performance on multiple criteria and a footnote by the senior rater. the appeals process of AR 623-3. Army NCOs in this grade. c. List two successive assignments and one broadening assignment (3-5 years). The DA Form 2166-9-2 is regulated by the Department of the Army Pamphlet 623-3 (Evaluation Reporting System) released in November 2015. The first part of the evaluation report is filled out by the rater and requires personal information on the evaluated NCO. This includes their name, email address, social security number, unit code, their station and organization, rank, the date of rank and various other administrative information. The second part of the form should provide identifying data on both the rater and senior rater. It requires both raters' personal information and information on their rank, branch, duty, and organization. In case a supplementary review is required during the evaluation, a separate part of the second section of the form is completed with information about a supplementary rater. The last three sections of the form - "Duty Description", "Performance Evaluation", and "Senior Rater Overall Potential Assessment" - should be completed by the raters in charge of the evaluation. The rater is required to describe the NCO's duties stating whether or not the NCO has met Army standards, and provide an evaluation of their performance and competencies on several criteria. DA Form 2166-9-2, NCO Evaluation Report, SSG-1SG/MSG.